Plenty of managers never asked, expected, or trained to be put in charge of other people. But when it happens, these accidental bosses often find that learning to manage is like learning to swim by being dropped into the deep end of the pool. Hank Gilman knows what that's like. As a top editor for Fortune, Newsweek, and the Boston Globe, he has helped nurture some outstanding talent. His success can be attributed largely to his management style, which allows him to treat his employees like, well, humans, while holding them accountable. But he was far from a natural when it was time to take charge. Gilman shares the lessons he's learned-through trial and error-during his two decades as a manager in one of the craziest businesses on the planet. Writing in a warm but no-nonsense voice, he offers straight-up advice on the ins and outs of hiring, firing, motivating, and dealing with cranky superstars. Gilman argues that your employees should always come first-and that managing down, as opposed to managing up, will ultimately lead to a successful career as a boss. Hank Gilman is the deputy managing editor of Fortune. Over his career, he has worked at The Boston Globe, The Wall Street Journal, Newsweek, and The Beaufort Gazette (South Carolina). (His favorite job.) He has also been a regular commentator on The Nightly Business Report on PBS. This book is well written by a person who knows how to write. You can tell that the author is a journalist and knows how to tell stories. This book is full of fun tips that all managers can take in looking at supervising people. It also provides some great stories that truly explores his points in humorous and sometimes semi-serious tones. While the stories and tips that he shares are sometimes light-hearted, the content is also quite serious. Overall, the book does get into some great content for all managers. Not only does it give some tips on how to let someone go, it also shares some things to think about when going into whether to fire someone. What should you think about when you have to let someone go. Why should you think about this? These people have families and responsibilities and usually it is because of them that they do the best work that they can. I liked the chapter on the pitfalls of electronic communications. The idea that you should always be wary of email communication as emails are forever and they can be shared with everyone potentially. This book has a ton within it. 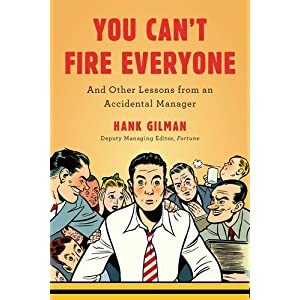 You will learn a lot in your own management style, and even if you are not a manager yet, you may be in the future, and there also are a ton of ideas on this book that will give subordinates pause as well. All-in-all this is a great book and one that I would recommend to anyone!